Max Capacity means Maximum Laptop Battery Performance. 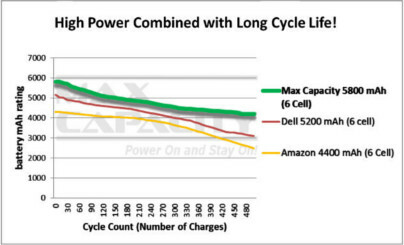 Our Max Capacity laptop batteries are designed to exceed all competing brands in both capacity and Product Service Life (a.k.a cycle life performance). Max Capacity batteries enable your laptop to run extremely long on a single charge while simultaneously extending battery service life. Our laptop batteries are superior to most OEM equipment out there! At the heart of our laptop batteries is a newly developed nickel-based positive electrode which enables very high capacities to be achieved. This technology helps prevent negative electrode deforming with repeated charging. It enables our batteries to achieve the highest capacity on the market and extend overall life of the battery significantly. Max Capacity batteries provide the highest performance over the whole service life of our laptop batteries. “NNP Technology” increases the service life of the product dramatically versus comparable Li-Ion laptop batteries. This means you won’t need to replace our battery as frequently, thereby saving you money.